Yoshiko Kawashima (May 24, 1907 - March 25, 1948) lies dead of a gunshot wound in a Beijing prison, on exhibit after her execution by the Kuomintang. Also known as Xianyu Aisin Gioro (her Manchu Royalty family name), Jin Bihui (her Chinese name), or as the courtesan Dongzhen (East Jewel), she was nicknamed the "Mata Hari of the Far East." The daughter of a Manchu Prince, at age eight she was adopted by Naniwa Kawashima, who befriended her father and ran Japanese espionage networks in China. She as educated in Japan and renamed Yoshiko Kawashima. At age seventeen she began wearing men's clothes; she later claimed her foster father raped her. Her persona is wrapped in apocryphal stories; the truth will never be known. She continued to wear men's clothes the rest of her life. She made relationships with a series of Japanese and Chinese officers throughout the thirties. Bihui met Japanese military attache and intelligence officer Ryukichi Tanaka, who utilized her contacts with the Manchu and Mongol nobility to expand his network. She was living together with Tanaka in Shanghai at the time of the Shanghai Incident of 1932. After Tanaka was recalled to Japan, Kawashima continued to serve as a spy for Major-General Kenji Doihara. She undertook undercover mission in Manchuria, often in disguise. She was considered strikingly attractive and domineering by most men she encountered; she may have dressed as a male to command her paramilitary group, or she could have been transgender. She convinced The Manchu Emperor Pu-Yi (February 7, 1906 - October 17, 1967) to return to Manchuria in March 1932 and serve as the figurehead for the Japanese protectorate of Manchukuo. She marketed herself to the Manchurian public, making radio appearances, recording records and releasing fantastic stories of her exploits to the press. The Japanese Press called her the "Joan of Arc of Manchukuo." Her celebrity status compromised her value to the Japanese Intelligence network. She raised a paramilitary unit to fight anti-Japanese guerrillas in Manchukuo in 1933, but the Japanese refused to work with her. She fell out of favor with the Japanese as she increasingly criticized their governance of Manchukuo and her public appearances were curtailed. She escaped capture by the Kuomintang for two months after the September 1945 surrender; she was arrested on November 11, 1945. Held in Beijing's Hebei Model Prison until March 25, 1948, when she was executed by firing squad. Her last act was to write a letter to her father. 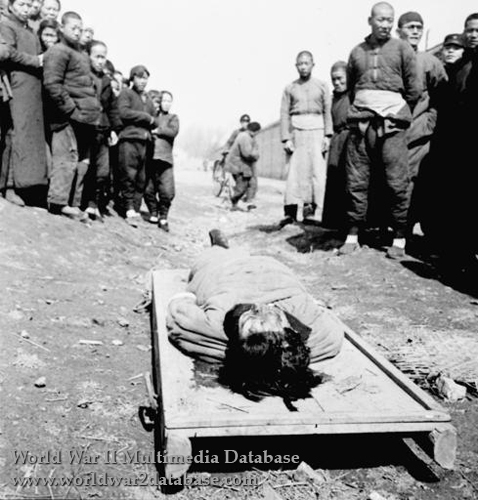 Her request of a private execution was not granted; her body was put on public display and seen by hundreds of Chinese.